This is such a cute holiday look! Again I am adoring your tights! What a positively adorable outfit! I like how the dots on your dress are very subtle. I don't know why but I have a love-hate relationship with dots. The ones you've got here I like very much! Your home looks so cozy! Both your Christmas outfits are very darling. This look is festive perfection! I love the pearl accents on your sweater--they're just precious :) The ferragamo-esque shoes are great, too. Such a festive outfit! I loveeee it. P.S. I saw a girl out shopping today who looked just like you! So uncanny. that polka dot dress is too cute :) love how the pattern is re-presented in the pearl-dotted sweater! The red tights with that white dress is my favorite look! Hope you had a good holiday, and happy new year!! ps thanks for your comment, i'm still so jealous you live in soho! Hope you had a magical christmas! Ooooh this is the perfect dress!!!!!! cute tights and lovely shoes, so so pretty! How perfectly festive and super stylish! The sweater is gorgeous, especially over a white dress, and the shoes are beautiful in a classic way. The red tights highlight your attractive personality. I can't imagine a better holiday look! Love yr pretty white dress. And of course a merry christmas! Kallie you always look so classic and sweet! I love the shoes, the tights, everything! You are adorable! YUM shrimp! It sounds like you had an amazing Christmas eve! Thanks for the Birthday wishes! ..and the quinoa tip... I love that stuff! Your blog is adorable. I'm coming back here often for style ideas!! When did you start fashion blogging? i love your outfit! and thanks for your comment! I LOVE that dress and your red tights! So very festive! What an excellent pearly sweater! Hope you had a wonderful christmas!I need to find me some red tights!! Thanks for the comment, my dear. Your blog is lovely...I dig your style (both photographic and fashion!). Hope you had a very merry Christmas in that sweet outfit. I'd never heard of a christmas calendar like that before. Counting down by putting little ornaments on the calendar tree sounds such a sweet idea! a fan of red tights I see... I really like your sweater, also, what is the animal directly behind your gold purse? Is it an actual stuffed animal or just a super realistic toy? oh i love your sweater so much!!! and the red tights are so cute!! the red tights with the white dress is the perfect pairing! CUTE! I especially love the red tights! Oh I do want a pearly sweater like that. Love the red tights too. Completely classy!! This outfit is festive but not overtly so. <3 The red tights are my fav part!! You look soooo cute! 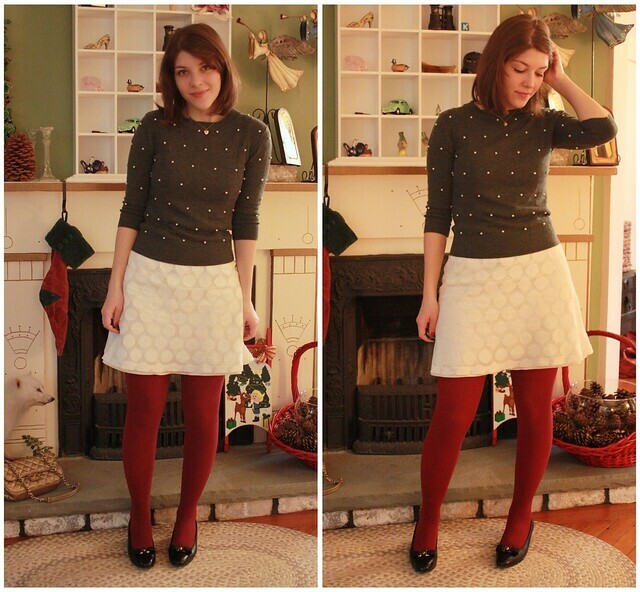 I love that sweater, plus the red tights are perfect for Christmas!! I love the sweater!! :) The pearls are just beautiful! :) an the red tights are a great touch! Merry Belated Christmas! and I did have great day!